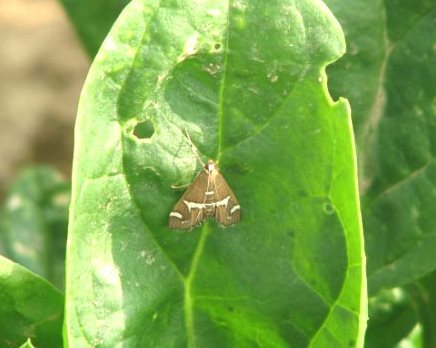 Hawaiian Beet Webworm infestations now present in southern and central NJ counties. Infestations of Hawaiian beet webworm were reported on in last weeks’ IPM Update as occurring in southern NJ counties. As of Tuesday of this week, similar infestations were discovered as far north as Mercer County. As of Thursday, none were discovered in Morris or Hunterdon counties, although sampling has been minimal there. The moths of this pest are easily found in weed patches; especially those containing galinsoga or pigweed. Moths hide beneath leaves, but readily fly when the weeds are disturbed. 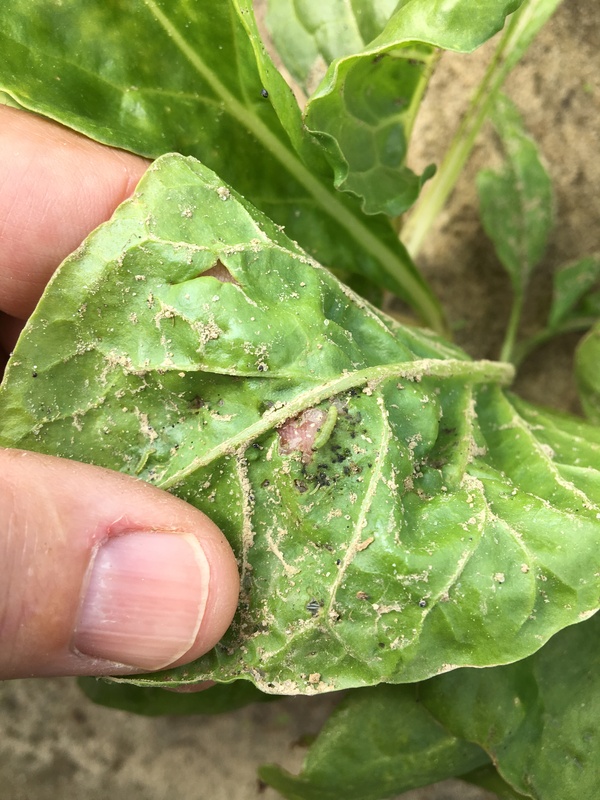 As mentioned last week, this pest attacks spinach, chard, and the foliage of beets and sugar beets as well as crops in the amaranth family. In processing spinach, the larvae (photo below) may be a contaminant issue. At this time, it is advised that growers of these crops in the southern and central counties inspect fields for the presence of adults and larval infestations. Should these be found, follow the 2018 Commercial Vegetable Production Guide for suggested materials to control webworm on these crops. In many cases, insecticides in the groups 28 (Coragen) or 5 (Radiant, Entrust (OMRI approved)) are permissible, effective and have short harvest intervals. Should this pest spread northward, further updates will be published on this site.